XL Video is supplying a high powered projection system, Pandora’s Box mapping and media server control, cameras and PPU to the current #willpower tour by will.i.am, which originated in the US and is currently in Europe. The tour’s all-white stage and production design was created by will.i.am and is heavily video orientated with minimal lighting. The tech savvy artist is involved with all aspects of his visual presentation - overseen by production manager Neil Porter - as well as bringing his innovative musicology and techniques to the stage. The set features three large inflatable heads – a larger central one which moves on and offstage throughout the show – flanked by two smaller ones. All three have a DJ set up on top and were constructed by All Access, together with three roll-down projection screens upstage of the heads. 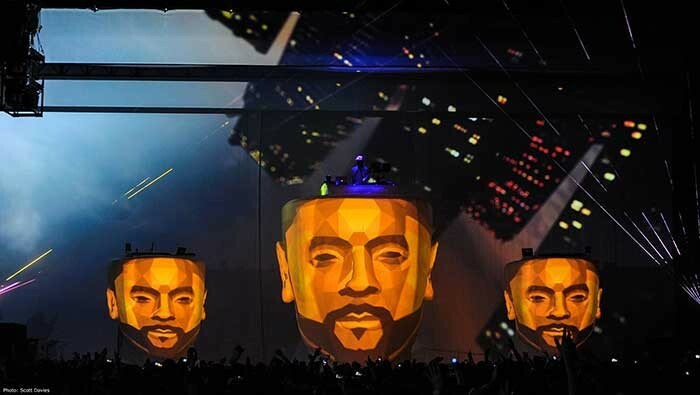 The projection system design was created by XL’s Clarke Anderson working very closely with will.i.am and media server programmer Ben Miles who joined the tour in Europe, and features 12 Barco projectors with a minimum brightness of 26k lumens. With the three heads – often running content of will.i.am’s face lip-synched to his vocals - the dominant aesthetic element of the show, the main challenge is to ensure that the 270 degree projections are perfectly mapped with no shadows, a complex task requiring the precise positioning of every projector at each venue, and each machine having its own discreet video feed. Four Barco HDQ-2K40 machines are placed at FOH and run in two pairs. One pair covers the front-most projected imaged onto the three heads when all are in position, and the other pair covers all three roll drop screens when they are in the down position and covering the entire back of stage (with the two side heads staying in position). The roll drops also have a header section which is projected on to and remains in place for the whole performance. In the middle of the stage deck left and right is a double-stacked pair of Barco HDF-W26 projectors which cover around to the ears of the two smaller heads. Depending on the venue, sometimes these are ground stacked on towers and sometimes flown, and the warps are tweaked daily for full precision as with all the projectors. Another two pairs of HDF-W26s flown just wide of the stage on the downstage edge fitted with .7 wide angle lenses are used to cover the rear cyc projections when the front projections can’t be used because the centre head is in place. The Pandora’s Box media server was specified to handle running content on to the heads during the initial production rehearsals in LA, chosen for its clever and very flexible warping and multi-layer mapping capabilities. Three Pandora’s Box servers are on the tour, two running live and one as a hot backup, each offering four outputs, giving a total of 12 x outputs. They are triggered by MIDI inputs from the backline. The cyc projections and header areas are run via a separate Catalyst media server system, with two machines fed via Datapath X4 devices giving a total of eight outputs. There is a substantial mash-up section in the middle of the show which is improvised each night – both musically onstage – and video wise, with content run VJ on-the-fly style by Miles and Pandora’s Box operator Erica Frost – together with laser operator Mike Hartle from Strictly FX. Miles comments: "It’s a really exciting way to work and we are all loving it." The video content was originated by a team of video artists in LA with all final editing and onsite content creation completed by Ian McDaniel from Good Theory. "We worked very hard to get a good selection of dynamic material," says Miles, "and we are all really pleased that Ian was brought onboard". The dramatic opening sequence starts with the stage and two side heads being revealed and the central roll drop out, with the gap filled by a large piece of circular scenery. will.i.am emerges from the floor on a stage left and is silhouetted against the scenic piece by the projections … which then continue as the main visual element and lightsource throughout the show. XL is also supplying two left and right IMAG projection screens in 16:9 format and a five camera package, three operated Sony’s (one at FOH and two in the pit) and two Panasonic robo-cams, all directed by Charlie Woods, The images appearing on the sides are primarily wide shots, and Woods takes in one of the Catalyst outputs to provide graphics and selected playback content which is output to the side screens via his Kayak switcher. Gerard Corey is the engineer. Clarke Anderson is also the crew chief and he, Ben Miles and Erika Frost are joined by Richie Jewell and Marcus Wareham on projection and cameras. The tour’s lighting designer is Paul Normandale. XL Video’s project manager for the tour Gareth Jeanne sums up: "This was a very challenging and complex project. It was clear from the first meetings that the show was going to be led by the video elements with other departments needing to make some big compromises to make it work. "Thankfully this was fully embraced by the other departments. Everyone came together as one team and the end product really demonstrates that. Working with will.i.am, who himself is very technology aware, has been a great experience. It is rewarding to work with someone who pushes the limits of what can be achieved which encourages all of us to approach a project differently."